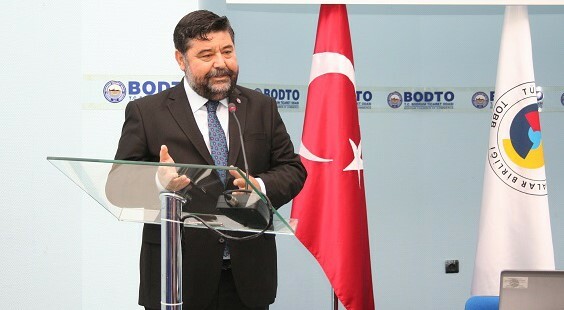 BODTO Chairman of the Board Mahmut Serdar Kocadon, expressing that an average of 15 gulets and tirhandil are being produced in Bodrum, is emphasizing the importance of handcraft in Bodrum. Chairman of BODTO who indicates that economic crises, firstly, affect yacht manufacturing sector, also notes that production capacity should be increased with proper branding and marketing. We have compiled Mahmut Kocadon's reviews published in 7 Deniz Magazines for you as Mavi Magazine. What are missing points and gaining points of the Turkish yacht industry? As we all know, our country is surrounded by 3 sides of the sea. Starting from ancient times, it played an important role in the development of Ottoman maritime, so the infrastructure of the yacht industry was formed. If we analyze the sector from the view of Bodrum, the maritime industry, which started with trade and travel with Greece, has developed with the establishment of a shipyard in Bodrum to be a source for the Ottoman naval base. If we get out of here, I think that our most important feature is that we can still continue the existence of wooden yachts that develop with handcraft in Bodrum with developing technology. This really makes our yacht industry different from other regions and countries. With the structure that can respond to the demands of the customer, it is an important feature of the production, which offers especially luxury and comfort together. The biggest missing point of our yacht industry is that it is not able to be mass-produced, marketing and, consequently, after-sales support services are inadequate compared to our competitions. Even though the country standards that is not very sufficient in terms of the development of the yacht industry we can say that our sector has succeeded greatly. However, on the other hand, we could not follow a stable course in this field, what are your thoughts about it? Since our country is not in the same economic conditions with many countries in many fields, it cannot have the same opportunity. Foremost support to be implemented in the sector should be increased in many major topics such as the taxes, customs and employment. Nevertheless, in Turkey, in yacht manufacturing industry, the best company of our country is a company from Bodrum. But still our yacht manufacturing industry's export figures should increase and competitiveness needs to develop. While the largest share is still in the automotive sector, it is known that when exported product unit prices and number are indexed, the size of yacht exports is higher. For this reason, I believe that it will be important for the yacht industry to be more stable and sustainable to complete the necessary physical infrastructure and then to support the sector with legal regulations. Especially, another topic that we should dwell on is yacht manufacturing industry does not only stick with its own sector but also improves and develops its minor sectors with it. For this reason, although the development of the sector now continues only on some centers, branding and marketing companies will be able to highlight their differences. Which country should be seen as a competitor of Turkey's yacht industry, which country should take its own example? When we analyze it internationally Italy, USA, the Netherlands and Turkey are the leaders of yacht industry. Branded Italian companies, especially in the Mediterranean region, offer intense pre-eminent practices and work. However in Bodrum, since both motor yacht and wooden yacht production have been seen, it offers a different alternative for Mediterranean, that's why we should evaluate our potential. I believe that the competitive structure of our region will increase with the increase of the number and capacity of the marinas. In the Bodrum area, with the yacht industry blue cruise was born, luxurious and mega yachts' tours in beautiful bays got more often. Like the other countries, many shipyards have had a difficult period with the global economic crisis and some shipyards have closed down and some have temporarily stopped their activities. But when the projects that has been going on analyzed I can be observed that Turkey shows better performance than its competitors. We are watching the economic crisis especially from the yacht manufacturing sector. Because we know that the crisis, at first, starts and ends in the yacht manufacturing industry. Perhaps this interpretation will be more decisive when it is based on economics. Because the yacht manufacturing sector is a sector that is used by the luxury and upper income group, which is spending, after a contraction and uncertainty in the economy, everyone is primarily concerned with their basic needs by reducing their luxury expenses. When we look at the records of our Chamber of Commerce, we also reach the same results. The Turkish yacht and boat manufacturing sector can come up with customized manufacturing, quality, and easy adaptation to technology, new designs and labor cost advantage. What is the demand and production of gulets, which are the symbol of this area in Bodrum? Yacht production in Turkey centered on Marmara Region (İstanbul-Tuzla, İzmit and Bursa), Aegean Region (İzmir, Muğla-Bodrum, Marmaris) and Mediterranean Region (Antalya and Mersin). The yacht builders have shifted to Antalya, Bursa, Yalova and Izmit over time because of the lack of space and the clean working environment of yacht production, especially in Tuzla, where large ship shipyards are located and the first starting point of yacht production. Muğla and its districts continue to produce Gulet type boats that have been used as coastal boats for many years. From this point of view, we established the "Bodrum Yacht Manufacturing Group" for the joint development of the competitiveness of wooden yacht manufacturing activities concentrated in Bodrum with the Ministry of Economy in 2009. With clustering, businesses are learning to compete together and trying to meet their needs together. As Bodrum Chamber of Commerce, with this logic, we try to support our sector representatives about promotion and marketing every year by providing their participation in domestic and international fairs. This year we represented our sector with our 800 m2 stand at the Eurasia Boat Show for both domestic and international markets. Gulet and Tırhandil are Bodrum's unique production and advanced manufacturing here, therefore we are working on the geographical sign. For this reason, beside the local demand for Gulet's order processing continues with international demand. Every year 15 gulets and tirhandils are produced. We should develop this industry's capacity with the right branding and marketing. We have been participating in the Boat Show since 2005, organized a Yacht Festival in Bodrum in 2010 and 2011, and played an active role in the bringing the Bodrum Sea Museum action. BODTO will continue to support this industry.